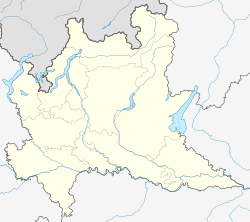 Cardano al Campo is a town and comune (municipality) located in the province of Varese, in the Lombardy region of northern Italy. Cardano al Campo is located strategically for his economy, since it can be found at only 2 km from Milan-Malpensa Airport. Apart from that, the town is distant 35 km from Milano. The name of the town is strictly connected to various historical events, as suggested by historians. The different assumptions considered: - carduus, a genus of flowering plants; -kar, a rock or a rocky terrain. This article on a location in the Province of Varese is a stub. You can help Wikipedia by expanding it. This page was last edited on 30 September 2018, at 18:09 (UTC).